COMMENTARY – With two games left to play, things are starting to get very interesting in both the Pac-12 and the national standings. Alabama is the sole unbeaten team from a Power 5 conference. The Pac-12 champion is destined to have at least one loss (and at this point, two losses are not out of the question). Utah can no longer afford to be the second-best team in the Pac-12 and still hope to go to the Rose Bowl. If the Utes want to be in Pasadena on New Year’s Day, then they had better plan on winning the conference championship outright. Otherwise, at this point it is anybody’s guess as to which bowl game they might play in during the holiday season. Can Utah win out? Yes. Will it be easy? No (as Tom Hanks so famously said in A League of Their Own, “It’s supposed to be hard. If it wasn’t hard everyone would do it. The hard is what makes it great.”). Will the Utes win out? We’ll just have to wait and see. Once again, I am getting ahead of myself. Although there are only two games left to play in the regular season, there are still two games left to play in the regular season. However, before we even get to the games left to play, let’s take a moment to touch on Utah’s win over Arizona State in Tempe last Thursday night. The first quarter of the game was possibly the worst quarter of football by the Utes this season (at least on the offensive side of the ball). Utah’s first play from scrimmage was a fumble recovered by Arizona State. The Utes’ second possession also ended with a fumble recovered by the Sun Devils. Utah’s third and fourth possessions were both three-and-outs. Arizona State led 13-0 going into the second quarter. 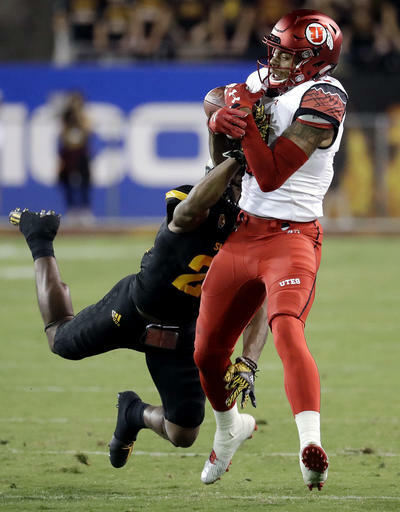 However, over the next three quarters the Utes played as well as they have all season long, outscoring the Sun Devils 49-13 and winning by 23 points. Joe Williams finished with 181 yards rushing and two touchdowns. Raelon Singleton stepped up and caught three touchdowns passes. Utah’s offense had eight plays of more than 20 yards, including an 82-yard touchdown run by Williams and a 64-yard touchdown pass to Singleton. The Ute defense chipped in with a 34-yard pick-six, a second interception (in the end zone to prevent a score by the Sun Devils), a conference-high 11 sacks, and 22 tackles for loss. While it would be far preferable if Utah played well for the entire game (and I think Kyle Whittingham would back me up on that), it is still encouraging to see the resiliency exhibited by the Utes in putting the first quarter behind them and taking care of business for the remainder of the game. Utah currently checks in at No. 11 in both the AP and Coaches Polls. It remains to be seen where the Utes fit in the college football playoff rankings on Tuesday, but it is probably safe to say that they are not going to be in the four-team playoff even if they win out. Whittingham was optimistic about the myriad possibilities as the season nears its end. But rather than speculating on what may happen down the road, let’s focus on what is going to happen this week. Utah hosts Oregon on Saturday afternoon in the last home game. The perennial powerhouse is a little off this year with a 1-6 conference record and only 3-7 overall, but they still need to be taken seriously. The Utes cannot afford to overlook the Ducks this week in anticipation of the season finale against Colorado next week. Oregon’s offense still chews up yards with ease (averaging more than 494 yards per game), and puts a lot of points on the board (averaging more than 37 points per game). The problem has been that the Ducks’ defense has been as porous as its offense has been prolific, and teams are simply outscoring them (averaging more than 43 points in doing so). For example, Oregon lost back-to-back games to Nebraska and Colorado by a field goal, 35-32 and 41-38, respectively, and more recently lost to Cal in overtime by a field goal 52-49. Utah proved it can win a shootout by beating UCLA 52-45 and, as noted above, had several explosive offensive plays just last week. The Utes will undoubtedly score early and score often against the Ducks. The key to the game will be shutting down Oregon’s offense, which I fully expect to happen on The Hill Saturday afternoon. Utah habitually holds opposing offenses to well below their season average for points scored each game. Of the seven conference games the Utes have played thus far, five opponents scored less than their season average, one essentially scored its season average (Arizona, which scored 23 points, and averages 22.4 points), and only UCLA scored more than its season average (the proverbial exception that proves the rule). Here’s hoping Utah continues to control its own destiny by downing the Ducks on Saturday. Note – Hunter Dimmick, with his five sacks Thursday, was named the Walter Camp national defensive player of the week last week as well as the Pac-12 defensive player of the week.